UW alumna and King 5 news anchor Lori Matsukawa speaks at the Leadership Fireside chat Nov. 4. Matsukawa is recognized as a community leader through her contribution in broadcast journalism and civic engagement. 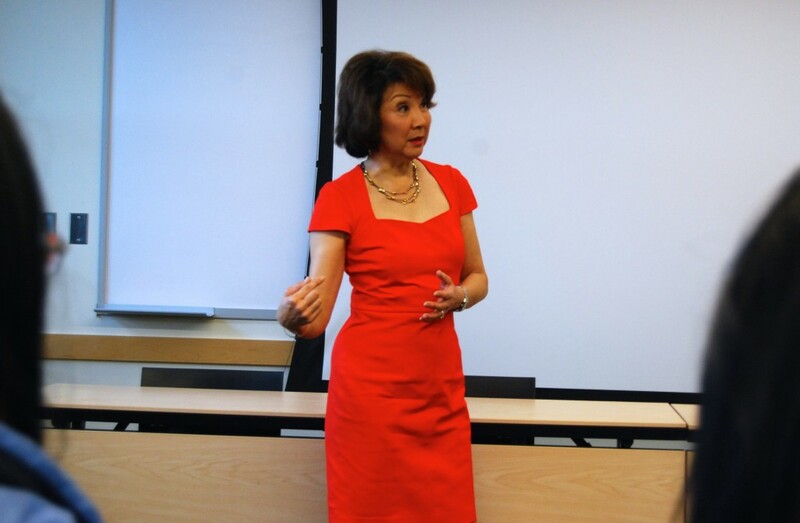 UW alumna and King 5 news anchor Lori Matsukawa described her young self growing up in Hawaii as a “dweeb,” and encouraged students to keep their eyes fixed on their goals rather than focusing on their pasts. The UW Department of Communication graduate and member of the department’s Alumni Hall of Fame kicked off the 2014 Leadership Fireside series Nov. 4 – a program hosted by the Husky Leadership Initiative (HLI) Committee in partnership with its presenting sponsor Starbucks to bring community leaders to the UW campus to talk about their career paths and leadership development. The committee is comprised of UW students, faculty, and staff and works toward a mission of advancing student leadership education opportunities through programming like the Leadership Fireside. HLI director Francesca Lo said Matsukawa exemplifies the leadership initiative’s mission to bring “effective change agents and contributing members in their communities” to the UW campus. Matsukawa, who currently anchors five newscasts daily, said she has always known she wanted to be a storyteller and shared her own story of becoming an acclaimed local anchor and community leader in Seattle. She said she decided to participate in a beauty pageant around the time she was applying for college, hoping to earn a scholarship. She won the local pageant playing the piano as her talent and eventually won the national crown and a $10,000 scholarship. Matsukawa said her aspirations to become a journalist were sparked when she was interviewed by news people during her travels as Miss Teenage America. She pursued journalism in her undergraduate studies at Stanford, writing for the school paper and developing her skills through internships. Matsukawa said her most memorable undergraduate experience came when she interviewed author Virginia Wolf’s son. She said she thought she’d become a print journalist at the time, until her managing editor at a local paper in Hawaii suggested she give broadcasting a try. Her broadcast career started with a small reporting job in Redding, Calif. and Matsukawa eventually worked her way up to Portland, Ore. and finally to Seattle. She has been in Seattle for more than 35 years. When she’s not broadcasting the news, Matsukawa says she spends a lot of time giving back to the community. She served on the board of the Japanese Cultural and Community Center of Washington in West Seattle and was among the founding members of the Seattle chapter of the Asian American Journalists Association, which raises money for scholarships and helps aspiring journalists of ethnic minorities, particularly those of Asian American descent, network and build skills to succeed in journalism. Student Starla Sampaco, who hopes to apply to the journalism program this year, said she has always aspired to become a broadcast journalist and considers Matsukawa an inspiration. Matsukawa encouraged students to pursue their passions, and to set short- and long-term goals for themselves. As for her own personal goals, she said she hopes in the long run to “retire well,” though she hasn’t figured out what exactly that means for her. In the meantime, she said a short-term goal is to collect enough pies and cakes to sell at her church bake sale in a few weeks.